The future of our society and our planet lies in recognizing Neurodiversity. Different brains are organized in different ways and are skilled at different tasks. People with so-called Bipolar Disorder have different brains. People with so-called Attention Deficit Hyperactivity Disorder have different brains and people who are Autistic have different brains. Having a Neurodiverse mind presents all kinds of challenges and may require learning certain skills both for dealing with sensory stimuli and with social settings, but it does not mean that the Neurodiverse individual is not completely beautiful as they are and that they cannot do amazing wonderful things that can save the world. Alan Turing was on the Autistic Spectrum. Harvey Milk was almost certainly Bipolar (II) and had a lot of ADHD traits. Would we want them any other way? No. In the novel series, you will see how Alan has many of the traits associated with Autism. He was brutally honest, trusting, pure, and at times child-like. He has at his disposal a huge supply of facts. He takes people’s words literally. He is always evaluating fresh data to build up his incredible mental map of the universe. When Alan is interested in something, he goes all the way and learns it, and that will include anyone lucky enough to be loved by him. Alan’s eye contact is either non-existent or full-on staring. Often he has a distant look in his eyes. He cannot understand a world in which being Gay is illegal, since he sees it only in its natural purity. He has trouble figuring out what other people are thinking but his tender heart is full of kindness and he has enormous empathy, so much so, it often floods his system. Oh yes, and he did stop World War II and invent the field of Artificial Intelligence, and many more achievements. My working theory is that Autistic people are emissaries from a galactic civilization way more advanced than ours. They probably are a telepathic civilization, hence the inability to read faces. They saw all the manipulation and cruelty and poor critical thinking of the humans on earth and volunteered to help us out. In my novel series. Autistic Alan is the perfect match for Harvey Milk, who like Alan, also has his special interests (Opera) and does not really fit in anywhere. Harvey has had some rather difficult romantic relationships in which he was treated very cruelly. What a blessing and relief for him to find such an honest, caring love in Alan, who like many Autistic people, could be incredibly funny when in his natural habitat. Harvey desperately needs to be with someone who can cast mental as well as sexual sparks and Alan usually does both at once! An Austistic person expressing their passions is a most beautiful life-enhancing thing. Autistic people can make incredible friends and partners and be incredible parents! Long live Neurodiversity! Let’s build educational systems that support all kinds of brains and help them thrive! UPDATE: Just recently I have confirmed, using Samantha Craft’s list for those who have been socialized as females, that I am super autistic myself. Only took more than forty years! My father, husband, other relatives, and some dear friends are also very spectrumy. 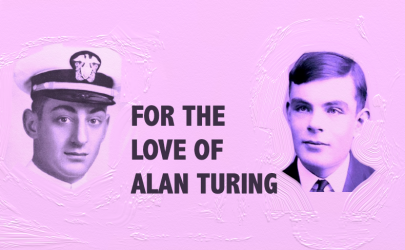 on’t miss out on the latest news about my novel featuring Alan and Harvey Milk: FOR THE LOVE OF ALAN TURING. Sign up for the newsletter below. Alan didn’t suffer from autism as is shown in the movie. You need to learn more about him. Since when have biopics ever been fully accurate? The movie is incorrect on numerous points about Alan as his relatives have complained. The movie claims he was a security risk when he wasn’t. It says he named the Bombe Christopher when it was named Victory. It is wrong on how he broke the Enigma. It denies him his sexiness. It makes Joan Clarke an extrovert when she was a shy introvert. It also makes Alan more arrogant. Above all the movie does not show how kind, humane, funny and Autistic he was. I have read Hodges’ Biography of Alan, Alan’s publications and several other books and documentaries about him. I also know intimately seven people with Autism. I have been studying Alan for more than 12 years. I appreciate your interest, but you, not I, need to learn more about him. Or perhaps you need to learn more about Autism. It is a spectrum and Alan would be on the Asperger’s side of the spectrum, which presents differently from some other forms of Autism. Here is some specific evidence. 1) Alan took words literally, 2) Alan was a little professor as a child 3) Alan had trouble reading social situations and social cues, 4) Alan had specialized interests and liked to talk about them best 5) Alan was honest to a fault 6) Alan had a child-like purity about him. 7) Alan was sensitive to uncomfortable sensations like clothing or fruit peels 8) Alan could focus on tiny details when analyzing, 8) Alan was a strong visual thinker. 9) Alan enjoyed conversations in which he could talk about facts. I could go on. While Autism is a challenge, you are wrong to say he “suffered from it.” Autism is a beautiful way to be and I wish we had more Autistic people in this world. Thank you for giving me the chance to set things straight about Alan. But please check your facts before making claims about what you think other people know. It’s always good to debate a point, but you could have worded your comment in a much kinder way. Oh by the way — I’m on the spectrum myself. It takes one to know one, they say. Apology accepted. Thanks for following my blog. In my novel series, I present the world with the real, authentic, very lovable, and beautifully autistic Alan Turing. The next best thing to meeting him personally.